You can configure log file and metadata storage settings in step 7 of the Create New Task process, or from the Log File tab when modifying a task (see Modifying an Existing Task). 3. 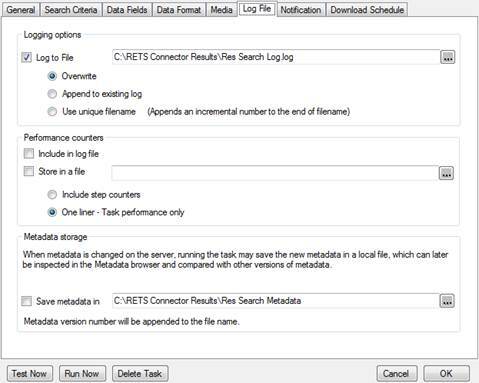 If you want RETS Connector to create log files for the task, select the Log to File checkbox. 2. Click the browse button to open the Save File dialog box. a. Select a location and specify a file name for the log file. You can use tokens when specifying a file name/path (see Using Tokens in File Paths). b. Click Save to return to RETS Connector. • Overwrite. When a task runs, RETS Connector overwrites the old log file. • Append to existing log. When a task runs, log information is appended to the log file. • Use unique filename. When RETS Connector runs, it renames the last log file (provided one exists) with an incremental number; it then creates a new log file for the just-completed task. a. Select the Include in log file checkbox to include the counters in the log file configured in step 1.
b. Select the Store in a file checkbox to include the counters in their own file. c. Select the Include step counters radio button to include performance counters for each step. d. Select the One liner – Task performance only radio button to not include performance counters for each step, but only for the task as a whole. 5. If you want to save the metadata retrieved by the task, select the Save metadata in checkbox. New metadata files will be created only when metadata on the server changes. a. Click the browse button to open the Save File dialog box. b. Select a location and specify a file name for the metadata file. c. Click Save to return to RETS Connector.